Sunday night, several hours after Irene had passed, our power went out. When it was still out Monday morning I packed up the kids and headed over to my mom's where we spent the night. 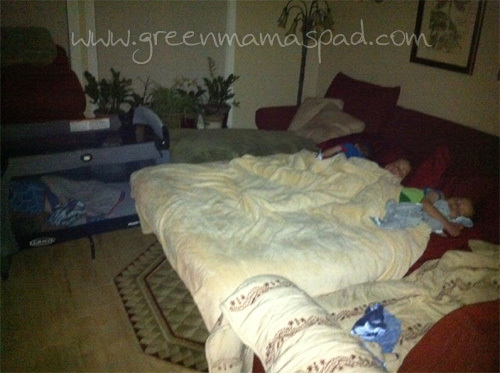 We all slept in the living room - the toddler in his pack-n-play, the other 3 on the sofa bed and myself on the far right of the couch. Daddy stayed home to watch over the house. My crew taking over Grammy's living room. Before you say how sweet they look, note that this picture was preceded by an hour of "mommy, he's touching me!" LOL! 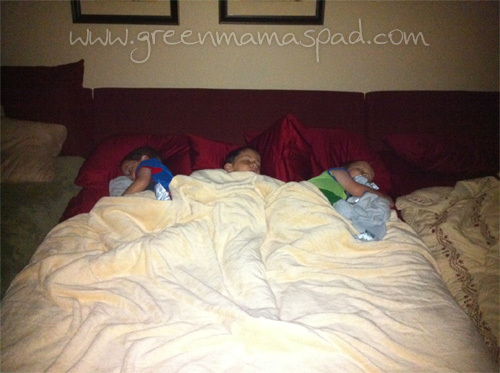 I can totally imagine the hard time you had getting them all to sleep in one spot! My TWO are ridiculous! Awww - I love how even storms can be fun! Kids are the same everywhere. LOL. They are adorable when asleep. memories they'll cherish when they get older! I love sleepovers! They look like they are all comfy and snoozing! I am drawn right to the blanket it looks so soft! I want one! I can't blame you for leaving when your power didn't come back. Living without electricity is NO fun. How long did it take them to sleep? Love they were all asleep finally though!! Hope all are back in their own beds now! Glad to hear you are safe after the Hurricane too! Kinda fun! We had no power for a few hours, but not overnight. Still we have neighbors with no power and no hope until Friday or Saturday at the earliest! I remember doing that a few years ago! Glad you're all safe! I'm glad everyone was ok and you made it through Irene unscathed! That is a cute pic!! Glad you all are safe. They look so peaceful. Aww you have to admit those are great memories minus the reason you all were there. So happy that all you ended up with was no power, i was so worried about you all in that path way! LOL! But they do look so sweet sleeping, even if they did keep saying "mommy he is touching me" lol! Sleepovers with little people is always a bad idea. I'm about to embark on a week-long visit to my mom's house where I will be going through the same thing. Ugh. I bet Daddy got the best night's sleep! I'm glad you're okay. So glad y'all are okay. Everyone looks so snug! We were without power after the tornadoes back in April, but thankfully, I could just let the kids run around outside because the weather was nice. Okay, but they DO look like angels in the picture! !